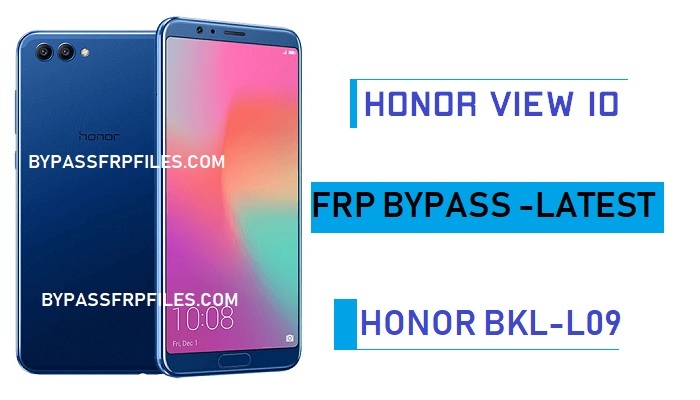 If you are looking for a solution to Bypass Google FRP Huawei Honor View 10, then check this latest method to Honor BKL-L09 FRP Bypass successfully from here. is your device is stuck on google account verification screen and you want to Bypass Google FRP Huawei Honor View 10 to access your device home screen so follow this tutorial to remove Honor BKL-L09 FRP Bypass. to successfully bypass your Honor View 10 you need download a few things and a working wifi connection. If you hard reset your device it will ask you to verify your previously synced Gmail id to verify device owner. then if you forget the Gmail ID and the password then you need to Bypass Google FRP Huawei Honor View 10 to access your device home screen again. We try this method on Honor BKL-L09, also work on other Honor View 10 series devices easily. To Bypass Google FRP Huawei Honor View 10 you need to download some files and a working wifi connection. files links are below. Honor has updated all the security patch level, Honor has fixed all the old bypassing method. and now we find a new way to Honor BKL-L09 FRP Bypass. follow the below process fully carefully to Bypass Google FRP Huawei Honor View 10. -First download FRP Files from another device or you can try with a working PC. -Download FRP application to Bypass Google FRP Huawei Honor View 10. -visit and download the “Quick Shortcut Maker.apk” from that website. -When downloading finished, copy the downloaded apk to your “MicroSD”card. -Then insert the “MicroSD” card to your Huawei Honor 9 lite. -Now follow below process to bypass frp from your device. -Then switch on your Huawei Honor 9 lite. -Once you connected your device to a working wifi connections then restart your device by pressing power key. -After that wait for “power on“ your device. -Now tap on the “Next” button from the welcome screen. -After that, tap long time with your “2” fingers on your device welcome screen to enable the talkback option from there. -Once you enable talkback features on your device then you will gey a talkback tutorial screen. -Now you have successfully suspended “talkback” option on your device. -Once you off the talkback then you will redirected to talkback settings again. -Now”Youtube” application will be open, from there you willl get extra sharing options by tap on the “Share” icon from the top right corner of the youtube application. -Just tap on the “Share” icon, then you will get a popup box again. -Now, tap on the “Gmail” icon from that popup box, then tap the”Skip” button from the below. -Then, tap on the”Add an Email Address”. -Now sign in with your any valid (yahoo,or Outlook,AOL) mail ID, (Choose any one) to successfully Bypass Google FRP Huawei Honor View 10. Make Sure:- Donot use Gmail account to sign in there. if you do then you have follow the above process again. -Once you successfully logged in with your mail ID, then tap on the “take me Gmail option from there”. -Now tap on the “3” dots from the top right corner of your Gmail application. -Then, tap on the “Manage Accounts” from there. -Now click on the “Accounts”. -Congratulations, now you will access your device settings. -Once you accessed your device settings menu then go down and then tap on the “Storage” icon from there. -Then tap on the “Storage Cleaner” options. -Then you will see the”MicroSD” icon from the top right corner. -Just tap on the “MicroSD” options from there. -Now you will successfully access “SD” card on your device. -Then find and install the “Quick Shortcut Maker.apk”. -Once installation finished, just tap on the “Open” button from there. -After that, on the “Quick Shortcut Maker” tap on the “Input keyword to filter” (Search) button. -Now, type and search there “Huawei home”. -Once the result will show on your device screen. -Just tap on the very first “Huawei Home” result from that list. -Then again a list of “huawei Home” option will open. -Select the very first “Huawei Home” from the list,and then click on try button from there. -Then you will back to “Not signed in” screen on your device screen. -Don’t be panic just tap on the “Back” key once. -Congratulations, now you will successfully access your device “Home Screen”. -Then, go to settings menu on your device. -Now go down and tap on the “System”. -Then Tap on the “Reset” option from there. -Then select and tap on the “Factory Reset data”. -After that, tap on “Reset Phone” option. -Done, now you have successfully Bypass Google FRP Honor View 10. -Once reset done wait for Power On your device, setup the all initial setup on your device. Thanks for visiting us, Comment below if you face any problem With this latest Bypass Google FRP Huawei Honor View 10 | Honor BKL-L09 FRP Bypass tutorial, we will try to solve your problem as early as possible.